The Low Down: There’s some kind of electricity between them…Emma assumes at first it’s her embarrassment at having tripped and landed smack into the bare chest of the most handsome guy she’s ever seen. For Galen, a prince of the Syrena, it is quite a bit more perplexing. How can this human send out signals like a mermaid…a Syrena? When the end-of-summer vacation with her best friend turns deadly, Galen sees Emma fight off a bull shark that has attacked and killed her friend. But it’s more than that; Emma seems to yell at the shark to leave…and it does. Has Galen found the daughter of Poseidon that can talk to fish…and keep the peace between the Houses of Triton and Poseidon? Why doesn’t she seem to know anything about being a Syrena? And as he falls in love with her, will he be able to give her up to marry his brother, the new King? Best Thang ‘Bout It: MERMAIDS! The story pulled me in the instant I started reading it. I could feel the lap lap lap of the waves as well as the action that was as fast as a cigarette boat. The story of the history of the Syrena was mesmerizing. The relationship between Galen’s sister, Rayna and her intended, Toraf was funny and tender (especially where she hit him). There was plenty of humor as well as a few mysteries, too. I’m Cranky Because: I. Don’t. Like. Sharks. Should You? : Yes, even if you can’t hold your breath underwater for more than 15 seconds. 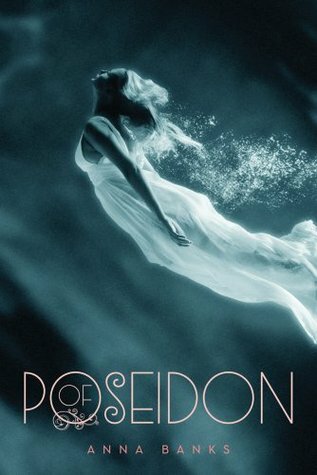 Of Poseidon by Anna Banks was published on May 22, 2012 by Feiwel & Friends.